This recipe is from my friend, Heather. She posted a photo of this on her Facebook page, and I told her I needed the recipe ASAP! This is a super simple dish to make. It is basically a dump recipe. It only took a minute to make, and it just simmers on the stove for a about 30 minutes. Alternately, you could dump everything into the slow cooker and let it cook on low for about 4 hours. Now, I did make a few small changes. I mean, what kind of food blogger would I be if I didn't change something? I added some spices, used frozen corn and added bacon. Bacon!! This chowder was fabulous!! Be warned - this chowder does have some heat from the Rotel tomatoes. If you are sensitive to heat, use a can of Mild Rotel. If you aren't sure, start with Mild Rotel and see how you like it. We didn't think this was overly hot. It has a kick, but it isn't burn your mouth hot. Thanks so much to Heather for sharing her recipe! This will be a regular dish at our house this Fall/Winter. In a Dutch oven, combine all ingredients. Stir to combine. Bring to a boil and simmer 20-30 minutes. It is a Mexican type spice blend. I used Pampered Chef's, but McCormick also makes one. You can substitute taco seasoning. I can see why you wanted this recipe ASAP! Looks fabulous! Is that Pampered Chef Southwestern seasoning? I used PC Southwestern seasoning, but McCormick also makes one. Quick, easy and delicious. Perfect for a busy winter day! Great idea abt using taco seasoning. I am adding this to our menu next week! Yumm! THAT is serious comfort food! I love this kind of soup in the fall and winter! So excited you shared my recipe! And your tweaks sound awesome. Hope everyone enjoys! Pinning this soup to enjoy it! 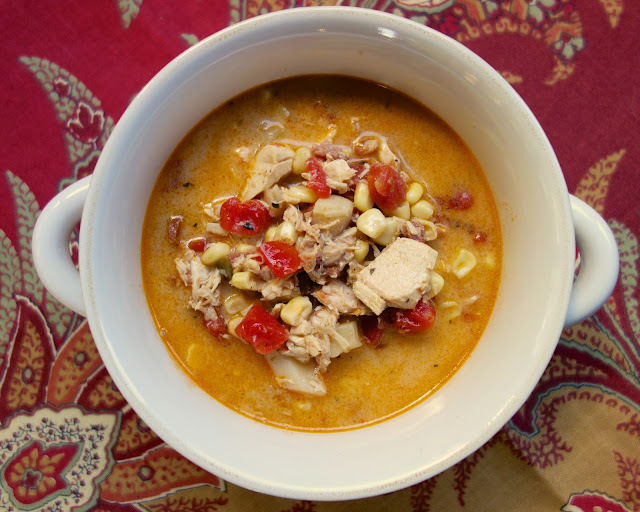 I love me some creamy corn chowder! I think I will make this for Bunco! 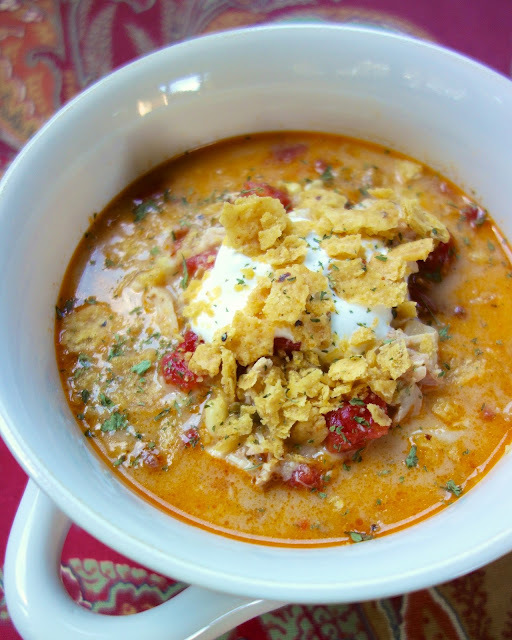 I looove me some corn chowder, and nothing can ever be wrong when bacon is added. Yum! Mmm nothing like soup on a brisk winter day! This looks fabulous Steph! I just have a question about the consistency...do you think it would be possible to serve this over rice? My bf doesn't think of soup as a meal :( but I think I can fool him if I could turn it in to some kind of rice bowl. Thoughts? I've never made a chowder before so I'm not sure about how thin/thick it should be. Thanks! You can certainly reduce the broth/milk a bit and stir in some cooked rice.